Two boys walking home from their village school taught us once again just how contagious cleaning up can be. It was Day Four of our trek to Everest Base Camp. As part of our "1 of 7" activities, we had been picking up trash along the trail. 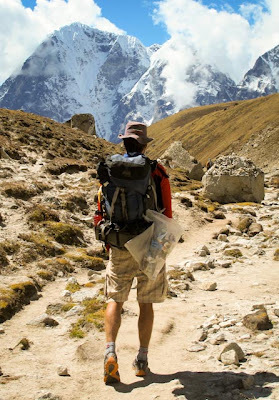 Yes, even on a trek to the world's tallest mountain--and passing through some of the most incredible scenery on the planet--people manage to throw trash on the ground, ignoring the well-maintained trash cans/baskets along the way. 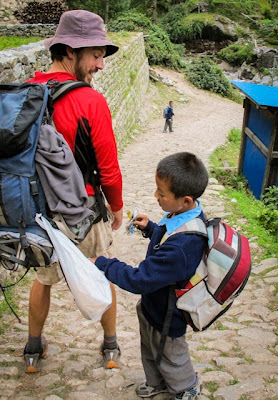 We had tied plastic bags to our backpacks and were filling them with candy bar wrappers, water bottles, empty tobacco packages and all types of other items tossed by local porters and foreign trekkers, as well. As we passed through a tiny village, two kids approached us in matching school uniforms--navy wool sweater and grey pants. They stared at our plastic bags, smiling. Then, one of them stuck out his hand and asked for rupees. In Kathmandu, lots of street kids will ask you for money. It's a pretty common occurrence. But out here, it doesn't happen. Feigning ignorance, Kip pretended he didn't understand the boy. Instead, he smiled and said, "rubbish." He motioned the boys closer and showed the two what was inside our trash bags. At first, they didn't get it, so he pointed to a piece of trash nearby and repeated, "rubbish" as he picked it up and placed it into the bag. He repeated the process again, and that was that...the kids joined us for the next kilometer or so on our clean up mission, helping us pick up trash along the trail until they got to the turnoff to their house. For the following days, we would be joined by lots of well-meaning folks happy to give us a hand. Like our new friend, Baptiste, a hilarious Frenchman who donned his own garbage bag while walking the trail (thanks, Baptiste!). And like Rob from Zimbabwe and his Aussie girlfriend Jolai who we ended up hiking with for three days (thanks, mates!). We even got their guide, Tiagaram, involved, chastising porters for throwing their garbage on the ground. The rock-climbing, trash collecting Frenchman Baptiste helps Kip take out the trash. It takes a lot to change people's behavior. It wasn't so long ago in the US that people saw no problem with throwing bags of trash out their car windows. Thankfully that has changed. Behavior on the Everest Trek is hopefully on its way toward change, too. Because of the incentive program started in 1994 by American mountain climber Brent Bishop, the garbage and used oxygen bottles left behind by Everest expeditions have been cleared from the high camps and summit of the world's tallest peak. 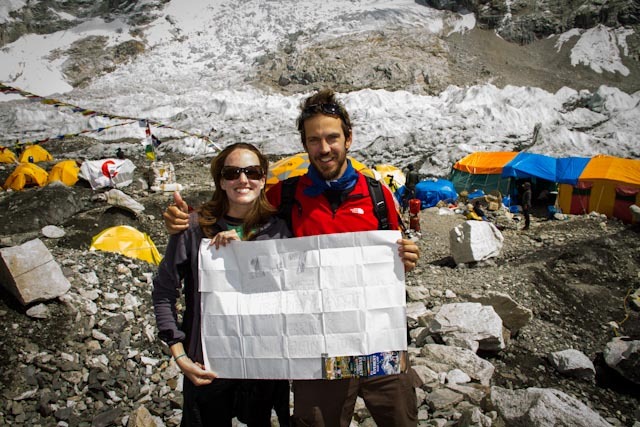 Us at Everest Base Camp, holding a sign that reads, "1 of 7 EBC Clean Up 2012." Judging by the numerous guides and hikers that said "thank you" upon seeing the trash in our bags, and those willing to pitch in and help clean up, we may be a trash-free trail the next time we decide to punish ourselves into another 12 day trek. 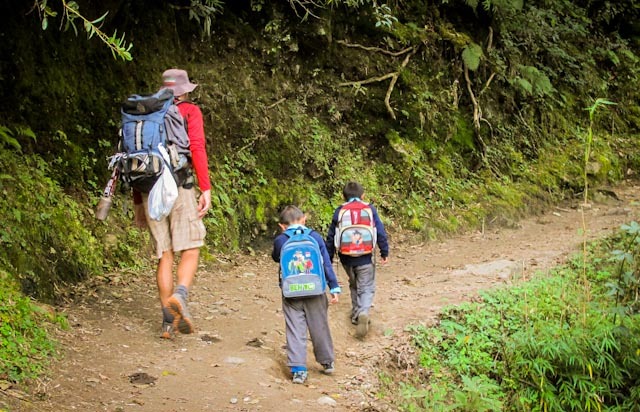 With a little help from the next wave of hikers, hopefully the trek up to Base Camp will see the same result. Kip the garbage man headed up the trail.